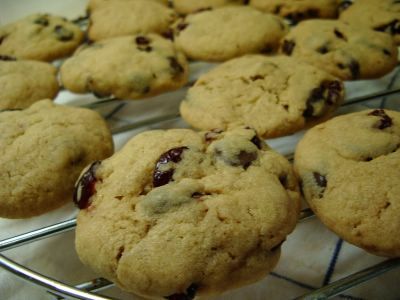 Cranberry and Chocolate Chip Biscuits – o frabjous day! I haven’t made biscuits for years, but suddenly felt the urge to today. I’m planning on taking my excess baking to work tomorrow, and I thought a few biscuits would go down well. This is a chocolate chip recipe from a generic cookbook called Better Baking, which I’ve altered by adding the cranberries. They’re very buttery – I’d like to try some different recipes so I can compare. Pre-heat the oven to 180C. Cream the butter and sugar together until light and fluffy. Beat in the egg and the vanilla. Blend in the flour – this will make the mixture quite stiff. Beat in the cranberries and chocolate chips. Roll the mixture between your palms into walnut sized balls, and then lightly squash down onto well greased trays. Bake for 15 minutes. Cool on a wire rack, and store in an airtight container.